If you like coffee or tea and you also like cookies or croissants, then you probably dunk your food into your coffee before eating it. You can of course dunk any food item into any beverage or into soup. If you push something or someone briefly under water or any other liquid, that is also to dunk. In US English, to dunk also means ‘to submerge yourself in water.’ In basketball, to dunk means to slam a basketball downward through the basket. As a noun, a dunk is any act of dunking and, in basketball, it is both the action of dunking and the name of the shot, which is also called a slam dunk or a dunk shot. Matt dunked his cookie in his tea. Tania dunked her bread in her soup. Will dunked his younger brother in the pool. Shall we dunk in the river? The player leapt forward and dunked the ball with one hand. Just give the cookie a quick dunk; if you leave it in too long, it will get soggy and break. The player's dunk won the game for her team. 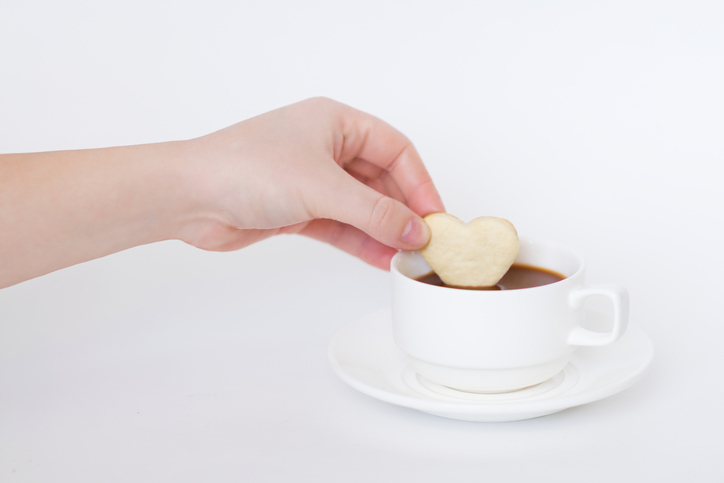 Dunking cookies in tea or coffee seems to be very common, but there is some discussion in Britain about whether it should be done, from an etiquette perspective. A newspaper took a poll of readers and discovered that, even though a majority of users admitted to dunking at home, over 50% thought that it was impolite to do so in public. A few tea rooms have even banned dunking and ask customers to leave if they do! So why is it frowned upon? Some say that it’s because it leaves a mess in the cup, while others argue that it’s because it was seen as something only children and the working class did in Victorian times. In either case, there is some push-back from people who love to dunk, and there’s even a Biscuit Dunking Appreciation Society (they have a website, if you’re interested, check it out. Want to know more about British tea etiquette? Here‘s a handy guide from a well-known tea company. Dunk is relatively new word in English. It dates back to the early 20th century, and came into (American) English from the Pennsylvania Dutch verb dunke (to dip or immerse). Pennsylvania Dutch is actually a German dialect spoken by a cultural group descended from German immigrants that settled in Pennsylvania. It can also be called Pennsylvania German, and is still spoken today. It can be traced back to the Middle High German dunken or tunken, the Old High German thunkōn or dunkōn (to soak), and ultimately the Proto-Indo-European root teng– (to soak). It is related to the German tunken (to dunk), the Greek tengein (to moisten), and the Latin tinctura (act of dyeing) and tinctus (dye), as well as the Spanish tinta and the English tincture. The basketball sense first appeared in the 1930s, while the noun (at first dunk shot), dates back to the 1970s.